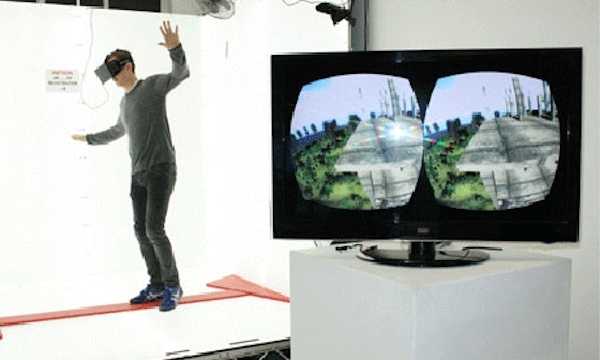 The future of virtual reality: want to conquer vertigo or have a go at surgery? Ever wondered what it would be like to tightrope walk above the city, dissect a human heart, and jump out of a plane at 10,000 feet – all in one afternoon? These are just some of the experiences on offer in a basement in east London, as part of the Digital Shoreditch festival next week, where the latest developments in immersive visualisation will be on show. Stepping into the subterranean test space of 3D technology company Inition, it feels like you have entered the gadget-strewn lair of James Bond’s Q branch. Its bright white walls are lined with cameras and screens, egg-shaped experience pods and glowing motion-capture units. A 3D-printed brain stands to one side, while across the room a holographic image of a watch spins in front of a monitor. Violent grinding noises erupt from behind a door in the corner – it wouldn’t be surprising if a velociraptor leapt out of the cupboard. In this den of discovery, the company has been investigating the potential of real-time 3D-graphics for the last 12 years. Remember that glimpse of the future that never happened, watching Dominik Diamond and Patrick Moore fumbling around with virtual reality helmets and gloves on Gamesmaster? Maybe you even had a go with one at the Trocadero? Well that retro-futurist technology might just be making a comeback. “VR never really took off in the way we all imagined,” says Andy Millns, co-founder of Inition. The technology, which allows you to look around and walk through computer-simulated environments, has long been used in medical and military applications – training surgeons and treating troops with post-traumatic stress disorder – but the prohibitive price of headsets (around £50,000) always prevented it from reaching a mass audience. Strapping on the visor feels like wrapping an Imax screen around your head – you enter an endless field of vision that responds continuously to your every move. For now, the proof-of-concept demos are somewhat basic and low resolution, but they still give a thrill. Step through a doorway and a vertiginous cityscape unfolds before your eyes, with a short wooden plank outstretched, along which you must inch your way before falling to your doom. Shock and horror seem to be the order of the day: the most popular demo released in the US simulates the last moments beneath the guillotine, complete with head-rolling visuals once the blade has plummeted. Virtual reality might still require a lot of kit, but Inition have also been making leaps in the world of augmented reality, which allows interactive graphics to be overlaid on real-time views, on the screens of smartphones and tablets. Much of Inition’s work has also come out of marketing commissions – from full-scale virtual cars for Jaguar, to interactive models of luxury riverside flats – but they have recently been working with architects and engineers to push the functional potentials of the technology beyond the novelty wow factor. Beyond the architect selling their project to the client, or the developer dazzling potential buyers with interactive cutaway facades, augmented reality could prove an extremely useful tool in the planning system. In Switzerland, proposed developments must first be erected in ghost form as a “baugespann”, with a full-size wiry frame marking out the volume of the building, so everyone can see quite how dominant it will be before it is given the go-ahead. In the UK, for now, the planners decide based on abstract drawings of plans and elevations, while the public have to make do with hoardings and billboards. But if planning officers and public alike could visit a site and see, real-time on their phones and tablets, just what the cumulative impact of development will be, perhaps a few more carbuncles could be avoided. Experience the next level of virtual reality and augmented reality applications at the AR v VR open house event on 29 and 30 May, 2-7pm, at Inition, 23 Curtain Road, London, EC2A 3LT.